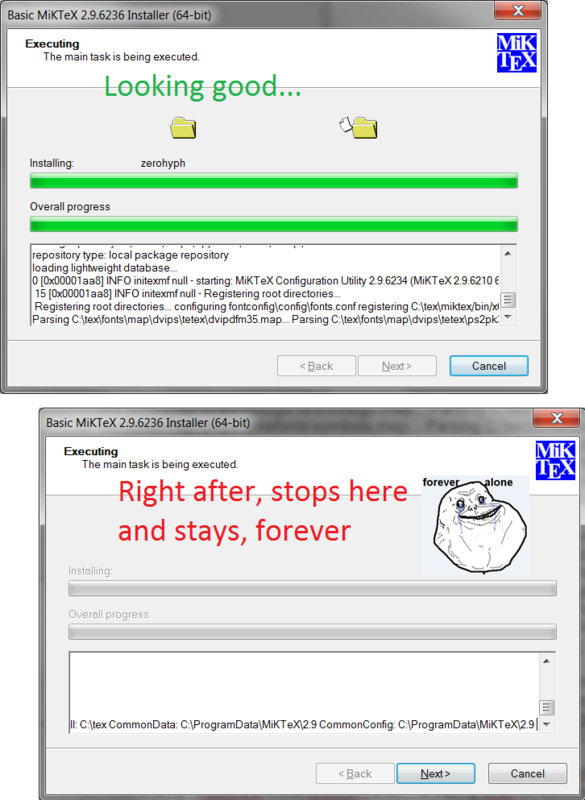 I'm installing MikTex 2.9 (basic-miktex-2.9.6236-x64 from miktex.org) on a Windows 7 64-bit OS, it simply does not complete installation neither reports an error code - i.e. installation continues forever... When hit Next, installation shuts, and later on using Texstudio, cannot connect to server, so cannot do any package installation, updates etc. Already tried installing MikTex as Admin (despite being the Admin user), the 32-bit ver., the portable ver., Protext, Texlive, as well as all the trials in a different machine (same Win 7, 64-bit), but nothing makes any effect - same install issue, same "cannot connect to server". Am I doing anything really wrong? Browse other questions tagged errors installing windows or ask your own question.